A generator is a machine that converts mechanical energy into electrical energy. Generators can be subdivided into two major categories depending on whether the electric current produced is alternating current (AC) or direct current (DC). The basic principle on which both types of generators work is the same, although the details of construction of the two may differ somewhat. In 1820, Danish physicist Hans Christian Oersted (1777–1851) discovered that an electric current created a magnetic field around it. French physicist André Marie Amperè (1775–1836) then found that a coil of wire with current running through it behaved just like a magnet. In about 1831, English physicist Michael Faraday (1791–1867) discovered the scientific principle on which generators operate: electromagnetic induction. By reversing the work of Oersted and extending the work of Amperè, Faraday reasoned that if a current running through a coiled wire could produce a magnetic field, then a magnetic field could induce (generate) a current of electricity in a coil of wire. 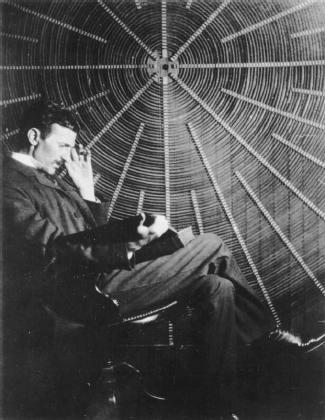 By moving a magnet back and forth in or near a coil of wire, he created an electrical current without any other source of voltage feeding the wire. Armature: A part of a generator consisting of an iron core around which is wrapped a wire. Commutator: A slip ring that serves to reverse the direction in which an electrical current flows in a generator. Direct current (DC): Electrical current that always flows in the same direction. Electromagnetic induction: The production of an electromotive force (something that moves electricity) in a closed electrical circuit as a result of a changing magnetic field. Slip ring: The device in a generator that provides a connection between the armature and the external circuit. Faraday also discovered that it makes no difference whether the coil rotates within the magnetic field or the magnetic field rotates around the coil. The important factor is that the wire and the magnetic field are in motion in relation to each other. In general, most AC generators have a stationary (fixed) magnetic field and a rotating coil, while most DC generators have a stationary coil and a rotating magnetic field. in a generator, the electrical power that is produced constantly changes. At first, the generated electric current moves in one direction (as from left to right). Then, when the coil reaches a position where it is parallel to the magnetic lines of force, no current at all is produced. As the coil continues to rotate, it cuts through magnetic lines of force in the opposite direction, and the electrical current generated travels in the opposite direction (as from right to left). The ends of the coil are attached to metal slip rings that collect the electrical current. Each slip ring, in turn, is attached to a metal brush, which transfers the current to an external circuit. Thus, a spinning coil in a fixed magnetic field will produce an alternating current, one that travels first in one direction and then in the opposite. The rate at which the current switches back and forth is known as its frequency. Ordinary household current alternates at a frequency of 60 times per second (or 60 hertz). The efficiency of an AC generator can be increased by substituting an armature for the wire coil. An armature consists of a cylinder-shaped iron core with a long piece of wire wrapped around it. The longer the piece of wire, the greater the electrical current that can be generated by the armature. Commercial generators. One of the most important uses of generators is the production of large amounts of electrical energy for use in industry and homes. The two most common energy sources used in operating AC generators are water and steam. Both of these energy sources have the ability to drive generators at the very high speeds at which they operate most efficiently, usually no less than 1,500 revolutions per minute. In order to generate hydroelectric (water) power, a turbine is needed. A turbine consists of a large central shaft on which are mounted a series of fanlike vanes. As moving water strikes the vanes, it causes the central shaft to rotate. If the central shaft is then attached to a very large magnet, it causes the magnet to rotate around a central armature, generating electricity. Steam power is commonly used to run electrical generating plants. Coal, oil, or natural gas is burned—or the energy from a nuclear reactor is harnessed—to boil water to create steam. The steam is then used to drive a turbine which, in turn, spins a generator. An AC generator can be modified to produce direct current (DC) electricity also. This change requires a commutator. A commutator is simply a slip ring that has been cut in half, with both halves insulated from each other. The brushes attached to each half of the commutator are arranged so that at the moment the direction of the current in the coil reverses, they slip from one half of the commutator to the other. The current that flows into the external circuit, therefore, is always traveling in the same direction. This results in a steadier current. The article is nice for basic understanding but will be good if formulas and drawbacks that are present in generators are given. i m a student of engineering .i like the description of generator principle.this helps me very much. Really very impotent subject matters explained very easy way.If you kindly provide more information it will be so much helpful for me. i am an engineering student, great site, is the ac generator for three phase the same operation, if not what changes exactly? i am realy impressed by the explanation of the ac generator thank you for making sure!!! This information is very helpful to me. I am a 4th year high school and will be reporting about generators next week. Thank you for this info, i hope it would be updated for more information and more detailed. i would like to know about the principle of operation of an a.c brushless generator. it is a nice clarification about the working principle of generators keep it up! After reading this article, i clearly understood the subject. But i require a more detailed explanation , i mean an animation will aid in better understanding. this is very useful for all the students .it is very intresting. A.C Generator details find this topic and learn this topic this is very useful topic so by care and read. if A.C current changes it's direction continuously..e.g back and forth then the resultant distance covered by the current will be zero..because it will be similar to vibratory motion with zero resultant. Thanks for a clear description of generator. For my project work and thesis i needed that. I am an electrical engineering student form IUBAT, Bangladesh. thanks for providing a remarkable concept.this will really help the new studnet. i want to know about principle working of diesel generator. Very good site. Got the idea about a generator. But the lack of labeled diagrams affect the understanding of the difference between ac and dc generators. Thanks to the creators of this supreme page. Im holding diploma in electrical and electronics engineering.If there is no output power in a generator what is likely to be the problem.